Each treatment option for an acoustic neuroma has benefits and limitations. By having an open discussion about your symptoms, age, medical condition, quality of hearing, tumour size and lifestyle, you and your doctor can determine the treatment plan best suited to your situation. An acoustic neuroma tumour typically grows at a slow rate. Your physician may recommend "watch and wait" if your tumour is small (less than 1.5 cm). If during regular periodic testing, your tumour does not appear to be growing or growing quickly, your doctor might recommend this option, particularly if the hearing is not too impaired. Keep in mind, an acoustic neuroma is a benign tumour and does not spread to other parts of the body. In older patients, researchers have found that many of these tumours do not grow or are so slow growing that any additional treatment is unnecessary. Moreover, testing and observing the tumour growth means that without adding the risks from radiation or surgery, there are reduced treatment risks. Your medical professional will monitor growth with regular MRI scans. If the tumour grows, or becomes life threatening, then radiation or surgery may be advisable. Radiation is commonly referred to as stereotactic radiosurgery and is usually not recommended for tumours exceeding 2.5 to 3 cm. This technique is used to stop tumour growth, preserve the function of facial nerves, and hopefully preserve hearing. You might not notice the full effects for weeks, months or years. Your doctor will follow your progress by periodically re-testing your hearing and performing regular MRI scans. Radiation for an acoustic neuroma allows the doctor to deliver precise radiation to your tumour without making an incision. After attaching a headframe to your scalp so that your head is kept still during the procedure, your surgeon directs radiation beams to the exact location of the tumour. An outpatient procedure, Gamma Knife is only one session. There is little downtime, and patients can typically begin resuming parts of their normal lifestyle the same day. CyberKnife is similar to Gamma Knife, except it does not require the use of a head frame. Instead, a mesh mask mould is created and used to keep the patient still during a radiation procedure. It is also an outpatient procedure, but unlike Gamma Knife which requires only one session, CyberKnife will likely require multiple sessions. There is little downtime, and patients can typically resume parts of their normal lifestyle the same day. Depending on the size of your tumour, hearing abilities and other factors such as health and age, your surgeon can use one of the several techniques to remove your acoustic neuroma entirely ("complete resection") or reduce the size ("de-bulk"). The decision considers not just the removal of the tumour but the ability to preserve the facial nerve and hearing, if possible. If the tumour is very large, or close to parts of the brainstem or facial nerve where surgery becomes risky, then your surgeon will suggest removing as much of the tumour as possible. ("de-bulk"). Patients will require periodic MRI's following any surgical procedure, and if the tumour is re-growing, a patient can then consider radiation treatment, instead of a second surgery. As with any surgery, there may be a worsening of your symptoms or complications that are unique to the nature of this surgery such as leakage or infection of the cerebrospinal fluid, stroke or persistent headaches. Risks are balanced by the surgical approach used, the size of the tumour and your personal situation. A Neurosurgeon and ENT medical specialist (Ear, Nose, Throat Surgeon) will jointly administer this surgical procedure. This approach is the most common procedure, where there is no useful hearing to preserve. The outcome will be a complete loss of hearing in the AN ear. Depending on the size, location and composition of the tumour, the surgical approach to the tumour enables a better chance of preserving facial nerve. The surgery is lengthy (may exceed 5 hours) and requires co-ordinating dates of the Neurosurgeon and ENT Surgeon, which may not be an issue (slow tumour growth). This approach is most common when the patient still has a serviceable hearing, and the tumour is small - medium size. Its goal is to preserve hearing in this case. 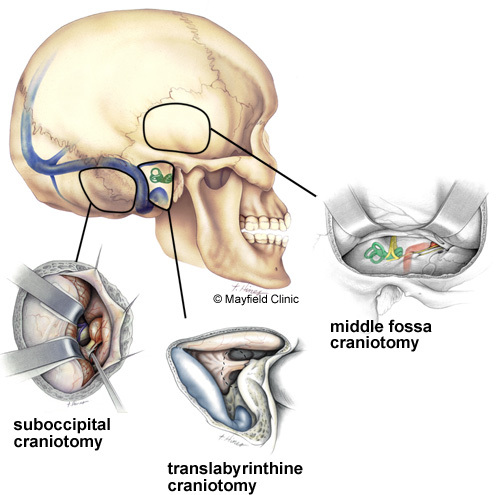 Alternatively, if the tumour is located close to the brainstem, this approach provides the surgeon with better access. This procedure is common where the tumour is small and in the right location, typically confined to the internal auditory canal. It is used to preserve hearing. If the patient's tumour is small, radiation would be considered rather than surgery which is more invasive.